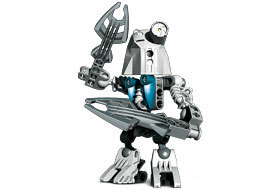 Kazi is the only Matoran who knows the deepest secrets of the island of Voya Nui! Sharp and sarcastic, he defends himself using twin echo forks which produce a devastating sound wave! Prefer to shop by phone? In English, call 800-453-4652, in French, call 877-518-5346. © 2006 The LEGO Group.